Using strong passwords, the latest antivirus software, robust firewalls, and other software security tools can keep your business safe from hackers and other evildoers intent on stealing data or unleashing mayhem on your computers via the Internet, but such protections are fundamentally useless when it comes to guarding those very computers or your business’s other tangible assets from outright theft. They can’t tell you that someone has broken a window or jimmied a lock and is now busy prowling inside your office, store, or warehouse, stealing you blind. An alarm system is a good idea, but you can’t activate it during business hours, when you, your employees, and your customers are on the premises. 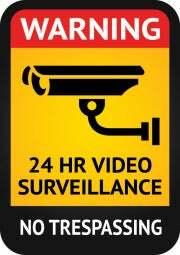 If you need to monitor a location in real time--and if you want to record what’s happening when you can’t sit around looking at a monitor--a video surveillance system is the absolute best option. We’ve put three such systems to the test. While each product is based on slightly different technology, the cameras in all three systems are outfitted with motion detectors (so they can record a video clip whenever something moves in their field of view) and night vision (so you can see what’s happening even in complete darkness). Each system allows you to monitor a collection of cameras from the location they’ve been deployed, or from anywhere you have Internet access and a computer, smartphone, or tablet. All three systems can record video clips to a hard drive for archiving purposes. All three of the systems we tested rely on a LAN, but each is fundamentally different in other ways. Logitech’s Alert system utilizes HomePlug powerline networking (ethernet over your existing AC power lines) and stores video clips on the cameras themselves (they’ll back up the clips to a host PC, if one is available). Swann’s DVR-4 2600 comes with its own digital video recorder, so it doesn’t need a host PC for storage. The DVR also delivers power to each camera, which means you can deploy cameras to locations that don’t have AC outlets close by. Trendnet’s SecurView Pro is a mix-and-match system that you build out using whatever array of Trendnet cameras--including wireless and Power-over-Ethernet models--best fits your needs. One system is not necessarily better than the others, but Swann’s is the only one of the three that doesn’t depend on a host PC. On the other hand, it offers the lowest-resolution cameras. Although Logitech’s system can get by without a host, it provides limited archival storage space without one, and it's restricted to six cameras max. Trendnet’s offering is easily the most robust and flexible of the three, but it’s also the most complicated to set up.